The morning rays stream in abundance through her kitchen window where she and her humble three burner stove stands. Her henna colored white hair glitters like gold, the untamed golden sun makes her lines and wrinkles even more visible. She leans forward for her almond shaped marble mortar and pestle, never placed an inch further from its designated place. She pulls her spice drawer and picks out the glass jar, labelled 'elaichi' in indecipherable Hindi writing, not that she ever reads or requires labeling. But most treasured spices always got a glass jar and a label. The rest, found their fortune in plastic containers. She picks up three pods, places two on the mortar and rubs the third between her palms and pops it into her mouth. Her mouth freshener. These days the cardamom hardly have any aroma, when we used to rub them between our palms and run the hand on our clothes, the cardamom would perfume for whole day, she said. 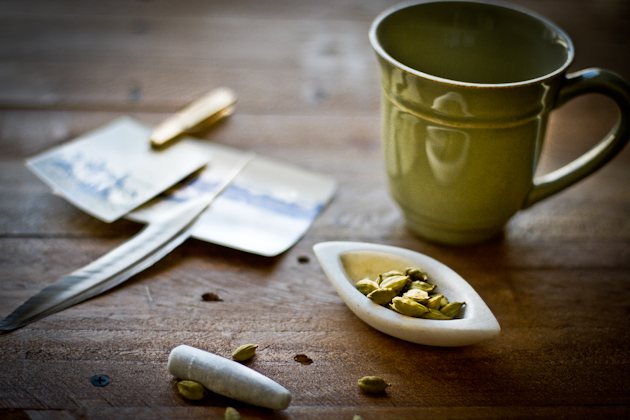 She begins to pound the cardamom pods, crushing the seeds to coarse powder and slides them into the pot filled with milk, tea and sugar. Slowly, the kitchen is engulfed by the sweet scent of cardamom. The stand is lined with cups and saucers for the adults, while the kids prefer their tea in mugs. It is tea time, she declares to call out everyone for breakfast as she fills her tray with cardamom and fennel studded rusks to go along with the tea. While this cake baked, the house was filled with aromas of cardamom, much like my grandma's morning tea time ritual. And the rhubarb is canned! I have been on lookout to buy some rhubarb lately, but haven't been able to spot any. In my desperation, I got some canned rhubarb, which left me totally uninspired for weeks. That's the difference between fresh and canned ingredients. Canned goods don't inspire. But when this cake came along, dare I say the canned rhubarb came really handy. They looked nothing like the beautiful ruby stalks of fresh rhubarb but when baked into the cake, they provided a creamy and gooey contrast to moist cardamom cake. This is the type of cake you want with your tea or coffee. Or the type where you reach out for a slice every time you entire the kitchen. It's not the type of cake you want to eat in one sitting, in a good way. It's the lingering cardamom taste you want to go back to after every little while. * Remove the skin and the grind the seeds only. The skins can be added to tea or coffee while boiling. ** I'm certain fresh rhubarb would work even better in this recipe and add a beautiful color too. Preheat the oven at 180 C. Line a 9 inch spring form tin with baking paper or aluminium foil. Butter the foil. Beat the butter and sugars together. Add the vanilla, cardamom and eggs and whisk. Mix flour, baking soda and salt. Add this into the above wet mixture. Add rhubarb, lemon zest and yogurt and stir with a wooden spoon. Pour the batter in prepared tin and bake for 60 minutes or until done. Sprinkle with cardamom sugar. Serve with sweetened or unsweetened cream cheese. This cake is wonderful slightly warm as well. This cake sounds perfect! Love this simple cake idea! Lovely story about your grandmother. I love that she pops a cardamom pod in her mouth. I, too, love the flavor of this newly found spice. Wow, I have never combined rhubarb with cardamom so far - that's something I definitely have to try soon! Thanks for the recipe! A wonderful cake and delightful combination of flavors! Oh, your sweet grandmom. 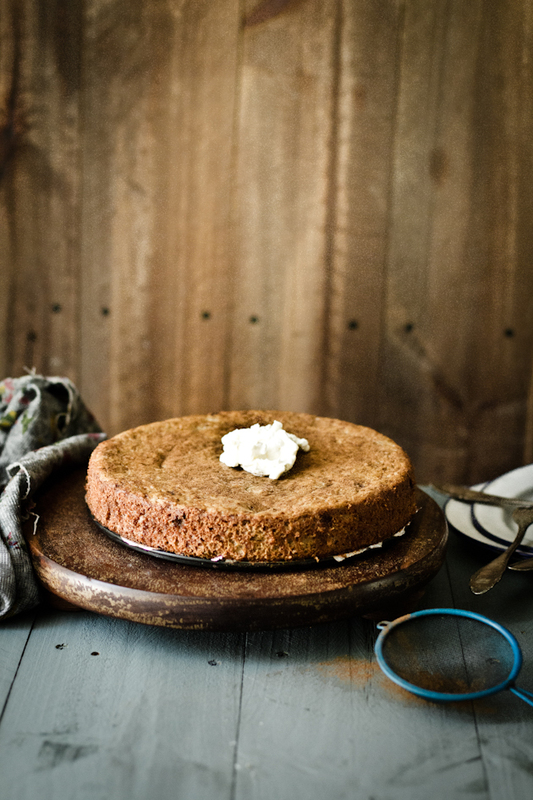 This cake must be so good with cardamom, one of the most flavorful spices. 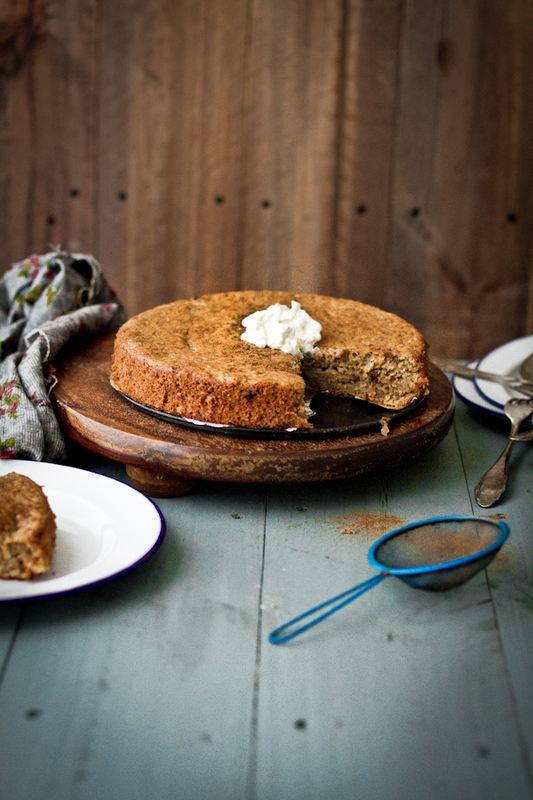 You know how much I love cardamom, so this cake is a winner in my books! I bet the rhubarb goes wonderful with the cardamom. Love how this is written in the third person - so creative! And lovely photos. This sounds scrumptious! Rhubarb is a bit of hit and miss for me too. But your recipe sounds really delicious. Would love to try it. Living here I have never bought rhubarb, beat that! :) I love the way you combined cardamom with it. Sounds yum! Really good one and even I liked the story also, have one word to say WOW!!! such a lovely story to go with a lovely cake. Love the short story of - I assume - your grandmother. Such a vivid description. Never had rhubarb before, although I've seen it and heard about it a lot. What does it taste like? Yes Fatemah - my grandmother. rhubarb - difficult to say what it tastes like but when raw it's sour kind of like green apple. When cooked with something sweet or sugar, it brings out the distinct sweet and sour flavor of it. Try it! where did you get your lovely colorful mesh strainers from?